A version of this story about Sandy Powell first appeared in the Down to the Wire issue of TheWrap’s Oscar magazine. On the road to notching eight Oscars and 35 nominations, costume-design legend Edith Head was often nominated for her work on both black-and-white and color films, which during most of her career were separate categories. 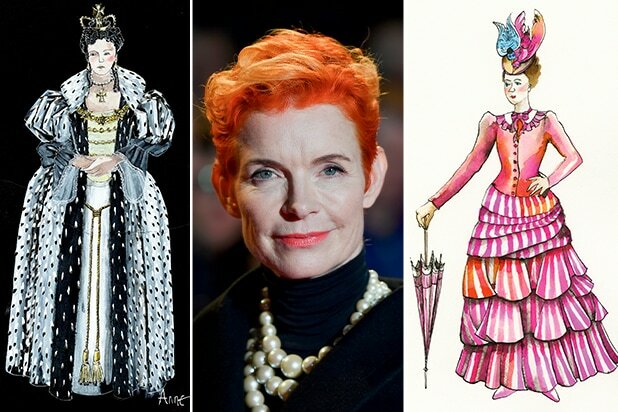 Sandy Powell, who just became the most-nominated living costume designer with 14 nods, doesn’t have that same luxury, so she probably won’t get near Head’s record. Like Head, Powell is accustomed to multiple nominations in one year; her nominations this year for “The Favourite” and “Mary Poppins Returns” mark the third time she’s competed against herself. But while she also received double nominations for “Carol” and “Cinderella” in 2015 and “Shakespeare in Love” and “Velvet Goldmine” in 1998, this year’s two noms mark the first time Powell worked on two projects simultaneously. And despite how many times she’s been nominated, it’s also the first time in a while she’s on set for a film while juggling awards season. Thankfully, the early 18th-century costume drama “The Favourite” and the 1930s-era “Mary Poppins Returns” are worlds apart. Speaking from the set of a film about the life of ’60s feminist icon Gloria Steinem, Powell said it’s trickier differentiating between 1962 and 1969 than 1708 and 1932. But the costumes on “Mary Poppins Returns” did have to detail subtle differences between the sequel and the original 1964 film. More than two decades have passed between the time frame of the two films, and the fashions changed dramatically. As for “The Favourite,” Powell said her designs are “based in historical accuracy with some artistic license.” The silhouettes and constructions are period appropriate, but the fabric is contemporary and she did away with the “mountains” of lace, which she says the production couldn’t afford. Powell said that finding that freedom of expression often comes when working with actors she’s designed for more than once. She was excited to finally be able to design for Meryl Streep on “Mary Poppins Returns,” but she’s most enjoyed working with actors she’s known from past projects, including Blunt, Julianne Moore, Cate Blanchett and Leonardo DiCaprio. And with an imaginative spirit in mind, Powell said she’d keep an open mind about taking her talents to a far different time period like the future, in one of Hollywood’s endless science-fiction films. To read more of TheWrap’s Down to the Wire Oscar magazine, click here. Actress Regina King, "If Beale Street Could Talk"
Director Barry Jenkins, "If Beale Street Could Talk"
Actor Rami Malek, "Bohemian Rhapsody"
Actress Glenn Close, "The Wife"
Bradley Cooper and Sam Elliott, "A Star Is Born"
Actresses Marina de Tavira and Yalitza Aparicio, "Roma"
Actors Richard E. Grant and Melissa McCarthy, "Can You Ever Forgive Me?" Actor John David Washington, director Spike Lee and actor Adam Driver, "BlackKklansman"
Director Peter Farrelly and actors Viggo Mortensen, Mahershala Ali and Linda Cardellini, "Green Book"
Writer Brian Currie, actor Mike Hatton, writer Nick Vallelonga and actor Paul Sloan, "Green Book"
Actress Olivia Colman, "The Favourite"